We get asked this question all the time. What’s the difference between Gili Trawangan, Gili Meno and Gili Air – and which Gili island do we recommend? The answer to that question, depends on who you are. These three island gems offer three unique propositions. Many travellers we come across tend to beeline towards Gili Trawangan, because that’s where everyone else is going. The fact of the matter is, that you would never expect these three beautiful islands in the Lombok Straight to have such different personalities. If you have the time to visit all three Gilis, you really should. Experiencing the different vibes of these diverse islands first-hand is the best part of the Gili experience, and understanding what makes this cluster of paradise islands so unique. Check out our aerial map of Gili Meno for a bird’s eye view of the island here. You’ll see stunning photographs of the island and points of interest. One way to explain how the islands are different, are through the local populations who live on the islands. In Gili Trawangan, most of the bar and restaurant staff I spoke to came from Lombok. I didn’t come across anyone originally from Gili Trawangan. They work the tourist hustle hard here, so they may one day return to the mainland. In Gili Meno on the other hand, there’s a small, but significant Sasak population who are proud of their roots. They’re industrious and hardworking people, and can be seen at all hours of the day on bicycles with coolers filled with ice cream, just at the time you want one. They come offering massages, homemade coconut oil and baskets of sweet baby pineapples. They’re also passionate about pulling together and improving their community. Right now, they’re raising money to build the best mosque in the Gilis. I couldn’t help but notice that their warung style dishes were fresher, and more morish than the street fare in Gili Trawangan. The island with the biggest personality however, has to be Gili Air, which has the largest indigenous population. They’ve adapted to the tourist trade, and done an excellent job of preserving their unique brand of island humor that makes them unique. They tease tipsy late-night passers hollering, “One for the road mate..” and they’re always up for a chit chat. Their endearing personality is evident throughout your stay in Gili Air, right up till you get on the fast boat. The island boys haul the bags up and down the boats like a circus act, pushing each other into the water and bringing a smile to people’s faces. What’s the difference in accommodation between the islands? The first thing people really want to know, is which Gili is more fitting to their budget? So I’ll give you a quick bang-for-your-buck snapshot. Prices for food and drinks, at warungs and restaurants, are the same across all the islands. What you get for your accommodation dollar on the other hand, can vary somewhat. Gili Meno, the most underdeveloped of the Gilis has a smaller range of options, but quality is brilliant. Mahamaya Boutique Resort and Karma Beach Gili Meno really stand out for a luxurious, and romantic island stay. Sandwhiched between two busy islands, in Gili Meno, you feel isolated and calm. You’ll really want to do very little, so splashing out on 5-star desert island service is a fantastic way to go. You’re still getting a great rate on luxury accommodation, which costs less in Gili Meno than in Gili Trawangan. The cheapest accommodation on the islands are in the villages, characteristically a good 10 – 20 minute walk from the beach. 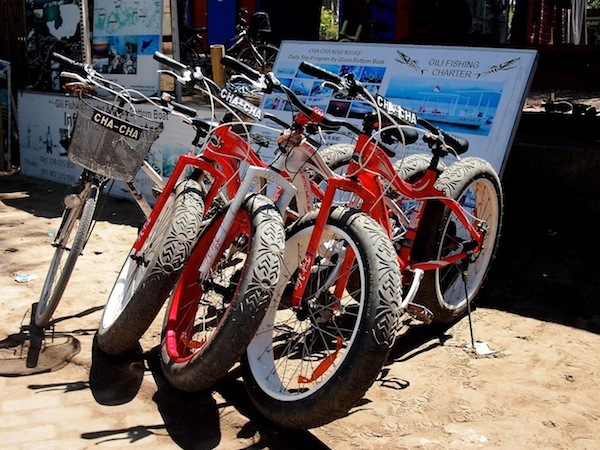 And remember, there’s no motorized transport on the island, although you can hire a bicycle to get around. Guesthouses and homestays cost US$10-20 depending on how busy the islands are (they’re always “full” the horse cart drivers will tell you, and they’re not far from wrong). But you’ll be sleeping on a scratchy bed and the showers struggle to dribble a drizzle of not-so-fresh water. Basically, it’s a little rough. There’s more budget accommodation on offer in Gili Trawangan, much less in Gili Meno, and in Gili Air, budget accommodation is really out of the way. To have a comfortable stay, and be close to the beach in the Gili islands, you really want to budget IDR450,000 – 600,000 a night. This will get you a lumbung style beach bungalow, with air-con and hot water on the higher end of that scale, as well as breakfast thrown in. Which is really all you need and want, at a basic level, to enjoy this island paradise. Elevator pitch.. A party island with a Bohemian vibe and a tonne of things to do, at all hours of the day. Who it’s for.. Social travellers and large groups. What we love most about Gili Trawangan.. The eclectic crowds, surprisingly good gift shops and boutique spas and of course, party nights and bonfires around Sunset Point. If you’ve done your homework on what makes the Gili islands tick, then you would have heard about Gili Trawangan’s epic party nights and full moon parties. Are they all that? Yes. You’re on a deserted island, miles away from the cares of the world, dancing barefoot on soft sand and getting tipsy in a singlet with a diverse group of international travellers, all buzzing on trippy mushroom milkshakes The next morning, a refreshing dip in the ocean will bring you back to life, and then what? But, Gili Trawangan is not just about the party scene. Being the most popular Gili island, it’s also the most developed. There’s more things to do, and more things on offer. Starting with the wall-to-wall cafes, dive shops and accommodation to the right of the boat landing, and popular beach bars on the left of the boat landing. You’ll find modern cafes that serve good coffee, green juices and continental baked goods, as well as breezy beach bars and restaurants with loungers and cushions right on the beach. This is the perfect spot for people watching and socialising with other groups of travellers during the daytime. For those looking for something interesting to do with the kids, there are three cooking schools in Gili Trawangan, and two stud stables where the young ones can learn how to ride an island pony. After a day of keeping the kids entertained, mum will find a selection of good spas and salons where beauty treatments are about US$10 a pop. On the street that runs alongside the Art Market, there’s a quality salon for manicures and hair cream baths. And just beyond Blue Marlin, there’s a tempting upmarket boutique spa for pampering treatments like Balinese massage and traditional lulur body scrubs, which can’t be missed. It’ll leave your skin soft and supple for days after. Gili Trawangan is also great for couples who want both option to retreat in privacy, and get involved with in the party scene. The desolate west coast of the island is perfect for this. Here, you’ll find wonderful boutique resorts such as Wilson’s Retreat and Five Elements that have private beachfront decks. These are great spots to people watch in the late afternoon, as visitors pass by on the rounds of the island, on foot and on bicycles. Elevator pitch.. A remote island paradise with talcum-white beaches and sparkling water, that you can have all to yourself. Who it’s for.. Families, couples and solo travellers. 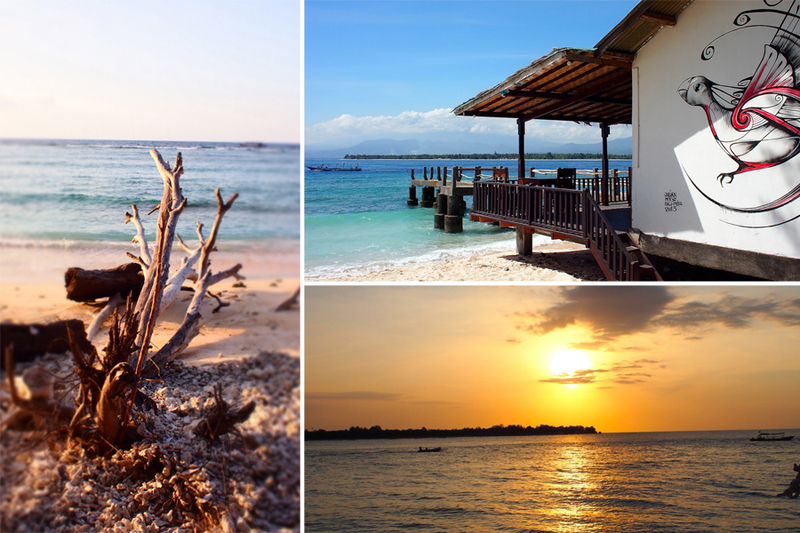 What we love most about Gili Meno.. This deserted island is an untouched, unspoilt, and unshared sanctuary. The finest sand in the Gilis and out of this world snorkeling off the reef – essentially, Gili Meno has the best beaches in the Gili islands. Gili Meno is the least populated and underdeveloped of the Gili islands. That’s because in the 90s, the Lonely Planet suggested that the island’s saltwater lake created mosquito problems. This was untrue, and it turned out to be a blessing in disguise. Today, Gili Meno is the most untouched Gili island, and it has the finest beaches and best snorkeling waters of all the Gilis. No contest. Accommodation, restaurants and activities are more sparse here. What you get in Gili Meno, is a glorious slice of island life, that you don’t have to share with the crowds. Walking around the island and observing the diversity of flaura, fauna and birdlife around the saltwater lake should be on any visitor’s itinerary. The island also houses a bird park and a turtle hatchery. Nightlife on Gili Meno is non existent, and as such, it’s perfect for families. The calm waters surrounding the island are the safest for kids to swim in, and they might even see a turtle just off the shore. It’s also the most romantic Gili island, and a popular honeymoon destination. Picture if you will, long walks on the beach at sundown with your loved one, a refreshing cocktail at a sunset beach bar, then sitting down for a romantic dinner at a table set in the sand, flower petals sprinkled on the ground and the surreal opal glow of moonlight. Coming soon to Gili Meno.. InGili.com has the inside scoop on a new ultra-stylish eco resort and beach club. It’s going to be the ultimate resort in the Gilis. So if you’re planning to visit Gili Meno in the future, sign up with BASK Gili Meno here and be the first to know when it’s ready for visitors. 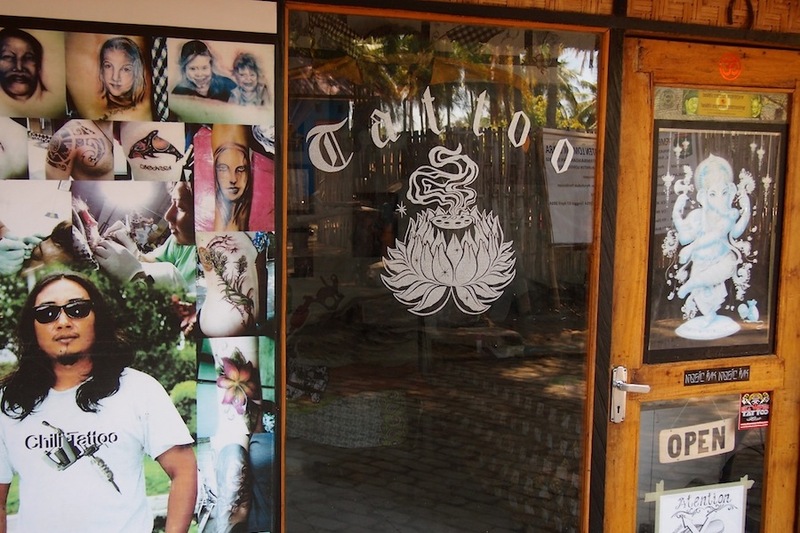 Elevator pitch.. An island attitude laid on thick, and an upmarket, alternative social scene. Who it’s for.. Bali expats, alternative couples and anyone looking for something different. What we loved the most about Gili Air.. The strong presence of island attitude among the locals, interesting places to eat, drink and socialise and a panoply of water sports. Gili Air is the island with the most attitude. 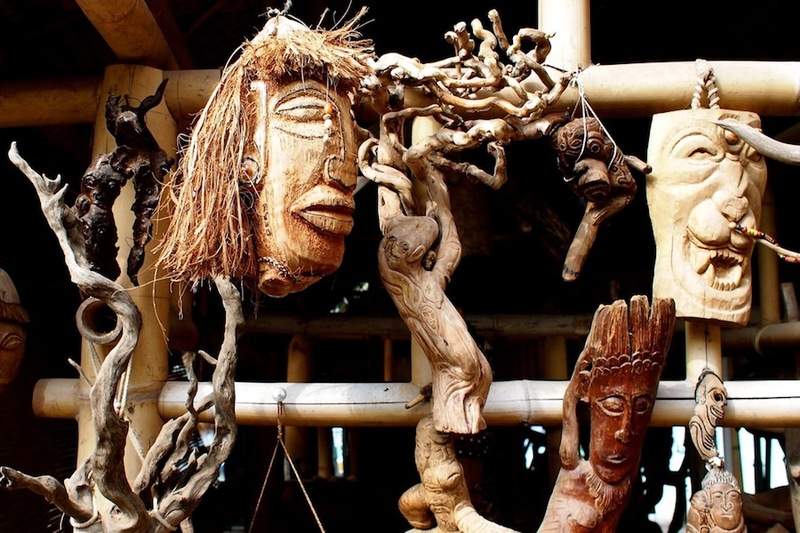 What they say in the guide books: Gili Air has the largest indigenous population of all the Gilis. What that actually means: The locals in Gili Air have welcomed the tourists, without losing their identity. Their sense of humor is evident on sign boards, their cheeky hollers, and they can be seen at all hours of the day, enjoying island life on the beach. You’ll definitely get the most sense of who the Gili islands are, in Gili Air. The island has taken off as the alternative party island, catering to Bali expats and the 30-something and 40-something social crowds. The beach bars are more easy going in Gili Air. Full moon parties and party nights here, unlike in Gili Trawangan don’t get too messy. There’s a cruisy social buzz and plenty of things to do. Beach bungalows, restaurants and shops line the entire east coast of the island, while the more desolate west coast offers better snorkelling and beaches. It’s a pleasant walk through the bustling hub, or you can rent a bicycle and get around. Getting lost in the village is also highly recommended, and all the paths lead back to the beach, so you don’t have to worry about getting lost. It’s also the most adventurous Gili island. Popular activities here include kayaking, paddle boarding, kitesurfing, and even surfing. It’s recommended to stay on the east coast and southern tip of the island, close to the boat landing where you’ll find plenty of interesting places to eat and drink. The recently opened Bel Air Resort has a fantastic restaurant that serves quality pasta, sushi, and cocktails. Other popular spots in Gili Air include Scallywags Organic Beach Club and Zipp Bar & Bungalows. Getting around in the Gilis is easy. The local shuttle boats operate once in the morning at 9am and again in the late afternoon at 4pm. If you’d like to island hop between the Gili islands, tickets for the public boat cost just IDR30,000 each way. Alternatively, you can hire a small outrigger, which seats about two to three people comfortably and should coast no more than IDR600,000 for the day. This way you can snorkel at the best spots, including the Meno Wall where you’re bound to see turtles, and it gives you the freedom to check out the other islands, at your own pace. 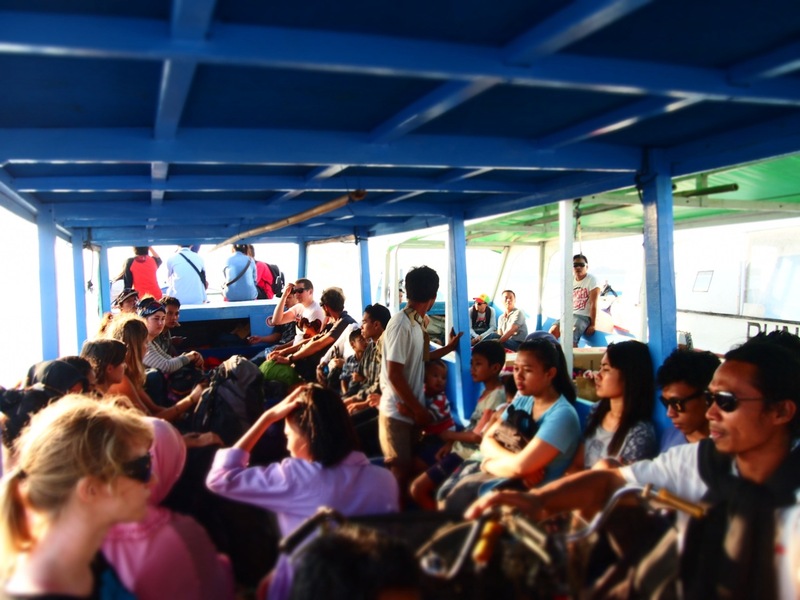 The cost of the public boat ticket to hop between islands has been revised upwards to IDR40K one way.